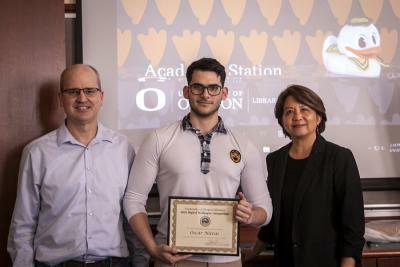 The UO Libraries Systems Department is pleased to announce the winner of our annual contest to design new digital wallpaper for the library's workstations and internet kiosks. Oscar Navas, a cinema studies major, created the winning design that will be used on 500+ computers throughout all seven UO Libraries branches in the upcoming academic year. He receives a $500 prize and a certificate of recognition. 2018 marked the seventh year of the digital wallpaper design competition, which is open to all UO students. UO Libraries received 20 entries from 14 artists. The winning design was selected by a committee of students, a faculty member, and library staff. "This is the first winning wallpaper design that includes a 3D image, the Duck," noted Al Cornish, director of library systems. The wallpaper's Duck was composed of over one million hair strands--pushing the designer's workstation to the limit.